Building Company Certification – Cockman Builders Ltd. Here at Cockman Builders we have a variety of certificates that show our professionalism, our ability and the accreditation that shows we are trusted, experienced and qualified building and roofing contractors. We are located in East Devon, on the coast here in Exmouth and provide building services in Devon and beyond. Cockman Builders was started by Dave Cockman over 30 years ago in the Pinhoe area of Exeter, Devon. As a close knit family business we have carried out many extensions, full house builds, major refurbishments and all general building and roofing works. 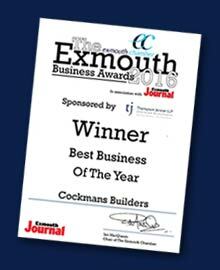 We were really proud to have been nominated for The Exmouth Business Awards ‘Best Business Of The Year 2016’ - and then we found out we had won it!! Footer content Footer content Footer content.